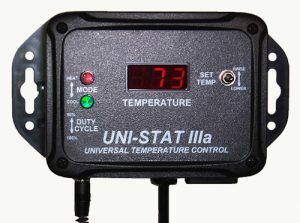 Whether controlling a refrigerator or freezer, or running a small pump with a cooling coil, for fermentation temperature control; or, for heating with a 120V element or heating pad, you won’t find a more effective or easier-to-use digital controller than this one – and no programming required! A unique ‘Duty Cycle’ feature provides for optimally smooth temperature control of either cooling or heating modes. 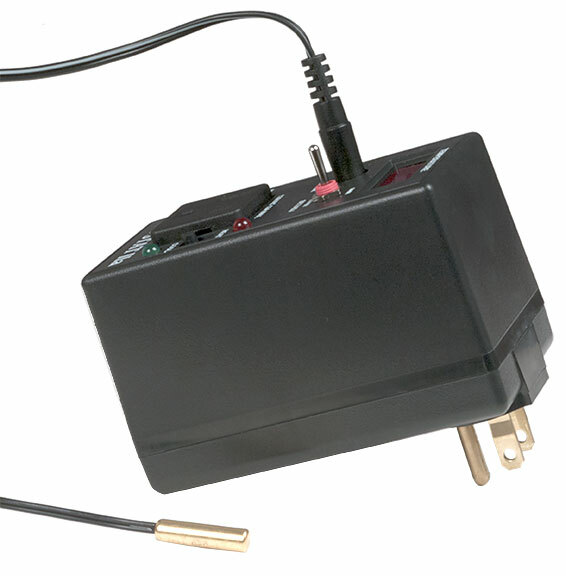 All the basic needs, plus simplicity, in this rugged controller – made in the USA, with a 3-Year factory Warranty! Some applications include: low-cost wine or beer storage, wine-making, beer-brewing fermentation, RIMS or BIAB regulation, chocolate storage, laboratory storage or incubation, space heating, freeze protection of plants or exterior water pipes, and many others you may have need for! 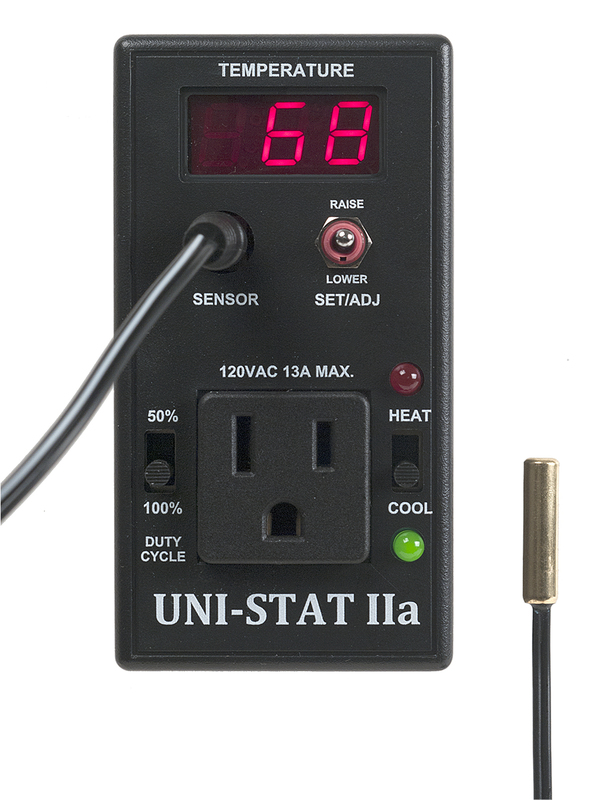 UNI-STAT IIa plugs directly into the 120VAC wall receptacle, or a 3-wire 15A grounded extension cord or power strip; then your 120VAC cooler or heater rated 13 amps or less (about 1500 Watts max) plugs into the UNI-STAT IIa front receptacle. No programming required! Set the MODE switch for either COOL or HEAT mode, then adjust the desired temperature with the convenient toggle switch to maintain within 1°F, which is continuously displayed. 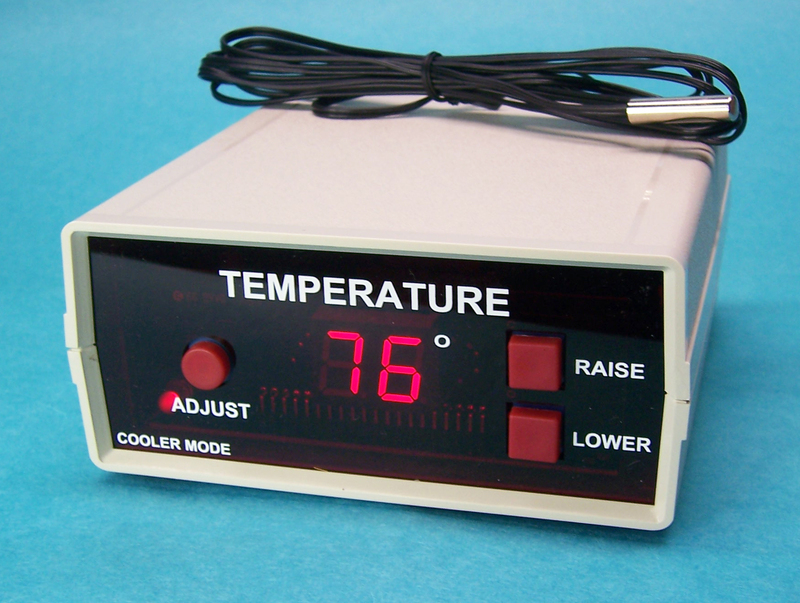 Temperature selection and display is from 10° to 220°F. Plug the replaceable 8′ temperature probe into the UNI-STAT IIa, with the sensing element at the location to be controlled. (You may extend it up to 100’ with ordinary “speaker” wire, if needed.) Also suitable for 1/4″ thermowell installation. For optimum regulation and energy efficiency, you may set the DUTY CYCLE switch to 50% while your unit is operating to maintain your selected temperature. The 50% cycle is 10 minutes ON, then 10 minutes OFF, in COOL mode (5 minutes ON, then 5 minutes OFF, in HEAT mode), then repeat, until the desired temperature is achieved and your unit is shut off. An LED indicator will light continuously whenever your cooler (or heater) is in operation, and will blink while in the OFF portion of the duty cycle. Features automatic “smart” switch-back to 100% if 50% duty cycle provides insufficient cooling or heating. Automatic sensor fault detection is an included feature, with visual flashing alarm and automatic system shut-off. Compressor protection feature in COOL mode, to prevent possible “short-cycling” damage. Automatic flashing ALARM activates if temperature exceeds set-point by 5° or more. Optional choice of bottle-probe temperature sensor for wine or beer storage application (see below).